Geoff Holt is an inspirational yachtsman and a memorable, entertaining speaker with some powerful messages to share. Geoff Holt entered the history books on 5 September 2007 when he sailed 1,445 miles, solo, around Great Britain in a fragile 15-foot dinghy. This was hailed a groundbreaking, courageous achievement because Geoff is a passionate yachtsman who uses a wheelchair. Paralysed from the chest down when he was just 18 years old after a swimming accident, Geoff lives by the mantra of ‘no excuses’ and continues to challenge what seems impossible. Another world-record was to follow. In January 2010, Geoff Holt became the first quadriplegic to sail across the Atlantic. As someone once joked, Geoff is now the most admired disabled sailor since Nelson! Recognition of Geoff’s achievements came swiftly. He was voted BBC South Sports Personality of the Year (2007); short-listed for Yachtsman of the Year (2008); received a British Airways Great Briton Award and the RYA Francis Elkin Award (2009). In June 2010, Geoff Holt was awarded an MBE for services to disabled sailing. 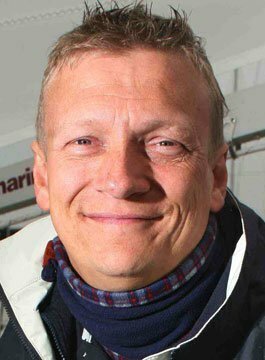 In early 2011, Geoff received the coveted YJA Pantaenius Yachtsman of the Year. Geoff’s record-setting voyage across the Atlantic in December 2009/January 2010 received international recognition. Geoff sailed a 60ft wheelchair-accessible catamaran named ‘Impossible Dream’: the 2,700 mile voyage across some of the most hostile waters in the world took 28 days. In completing his latest ‘Personal Atlantic’ challenge Geoff Holt became the first quadriplegic sailor to sail solo across the Atlantic unassisted in every aspect of the sailing. Symbolically, Geoff finished in Tortola in the Caribbean on the very beach where he originally broke his neck 25 years ago. Geoff hopes that his voyages will inspire others to push their own personal boundaries. Geoff’s story is highly motivational and told with humour, thoughtful insight and great photographs and film footage. He has faced adversity, challenged limits and continues to inspire others to maintain a positive attitude no matter what the challenges ahead. Geoff’s marketing background ensures his business messages are rooted in his experiences both on and off the water – a powerful combination. Clients across all sectors enjoy both his after dinner/after lunch talks and conference keynotes. Geoff’s story has some powerful messages about overcoming adversity and staying positive in tough times. At just 18 years old, Geoff Holt had sailed across the Atlantic Ocean three times, completed several solo voyages and sailed over 27 thousand nautical miles. And then his life changed. All hopes, dreams and expectations of earning his livelihood as a professional yachtsman were brutally destroyed after diving into the sea and breaking his neck. Geoff spent a year in hospital and then, with characteristic spirit, he retrained in a different career and went on to lead the marketing department of an international firm of chartered accountants for 12 years. Geoff Holt later became a qualified auctioneer and valuer (specializing in early European ceramics) and eventually returned to his first love of sailing. He is the fastest disabled sailor to circumnavigate the Isle of Wight and firmly re-established himself as a yachtsman with his successful Personal Everest challenge. Geoff visited 51 destinations and took 109 days to complete his voyage in testing and hostile conditions. Geoff Holt has a very inspirational view of life and the opportunities it holds. His positive outlook comes over strongly in every speaking engagement.